Hello! Now I'm no standard guru but I can help! 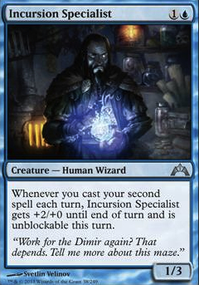 Your deck has good bones but I think it is too slow to stand up to the meta. 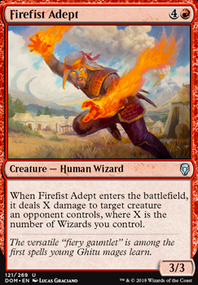 I tried to do a izzet deck with Adeliz, the Cinder Wind and it was too susceptible to removal and counters. I would look at Crackling Drake and Enigma Drake for some evasion. Also Arclight Phoenix . 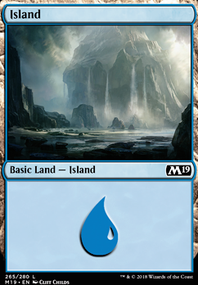 You can always look at MTG goldfish for the current meta and what decks won tournaments, but personally I like to build standard decks that are a bit more on the jank side. More fun in my opinion. Hope I was some help and would be glad to ask any questions! I've been working on an Adeliz, the Cinder Wind edh deck that I plan to put up on here later and was just curious if anyone would have recommendations for some good cards for it. 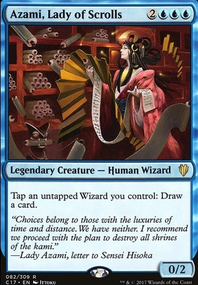 I have a bunch of good wizards already for the deck like Azami, Lady of Scrolls and Baral, Chief of Compliance so I think I'm just really looking for good instants and sorceries. 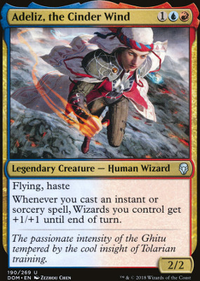 The first variation is a super aggro deck built around Adeliz. 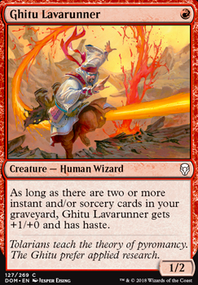 You throw down little, aggressive wizards like Siren Stormtamer , Ghitu Lavarunner , and Viashino Pyromancer and get some early damage in. 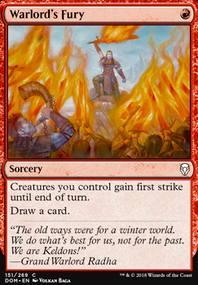 Then, when the time is right, you slam Adeliz, attack with everyone, throw all your cheap burn spells at your opponent's face, and deal like 30 damage in a single turn. 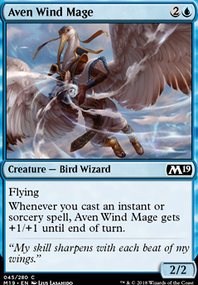 Adeliz needs such cheap wizards to go wide quickly and cheap spells to "storm off" with her, that I don't even include Wee Dragonauts and Aven Wind Mage in my deck because I feel like they are too expensive. 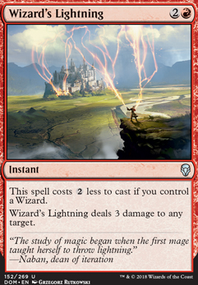 The second variation is a slower, burn them over time plan using cards like Guttersnipe , Goblin Electromancer , Electrostatic Field , Niv-Mizzet, and Murmuring Mystic . 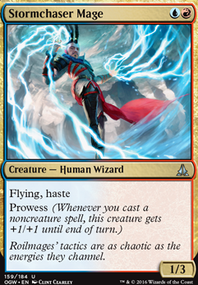 This build is essentially a counter-burn deck which controls the board state and slowly kills the opponent with incremental damage using the creatures above. The third variation is built around Naban. 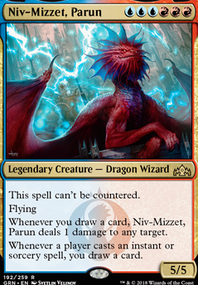 I know you don't have Naban on this list, but have all of his best students: Merfolk Trickster , Viashino Pyromancer , and Exclusion Mage . 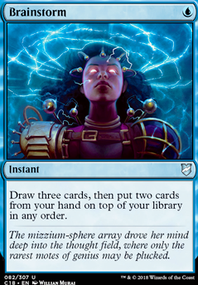 This is a tempo deck where you gain value off of your wizards and blink them over and over again with Siren's Ruse or, if you're Jeskai, Justiciar's Portal . Finally, this isn't a wizards build, but people keep mentioning them so I figured I should too, and that is a deck using Crackling Drake and Enigma Drake . 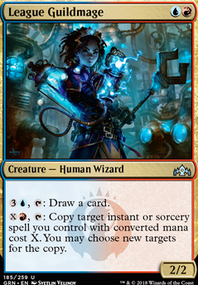 Aside from having Goblin Electromancer , I don't think it really has anything to do with Wizards perse, but it does play similarly. 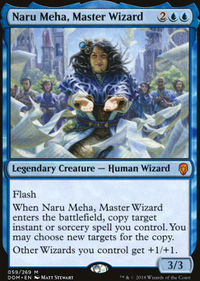 I played the double drake deck when Ravnica first came out and I did so without Arclight Phoenix because I couldn't afford it. 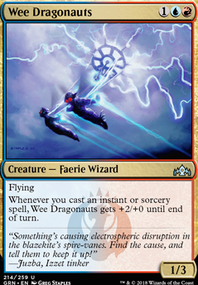 The goal of this deck is just to slam a Drake and make sure it survives while slowly powering it up. There are more tempoy builds which are more aggressive and slower, more control builds. I hope this helps. 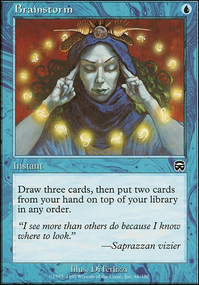 Having a single strategy in mind really helps refine decks and give them a ton more consistency. Figure out what style of play you like best and I would hone in on that. Or you could be like me and just build them all! 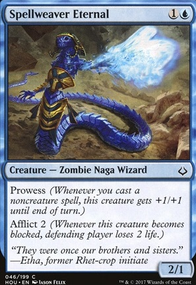 Wizards is my favorite tribe.